Today is the First Sunday of four which leading up to Christmas are collectively known as 'Advent'. In terms of the colours of the season, this is one of the two purple seasons (the other preceding Easter being called 'Lent') that are taken up with examining ourselves and effectively cleaning the house that is our body from the detritus of sin and because of this are called 'penitential' seasons - because we are sorry (i.e. penitent) for the things we have done wrong that clutter up the rooms of our spiritual house. The Patriarchs - Abraham, with whom it all begins through to David in whose city Jesus is born. The Prophets - Those who foretold stuff regarding the who, what and how of Jesus. John the Baptist - The herald for Jesus and the bloke who baptises Him at the start of His ministry. 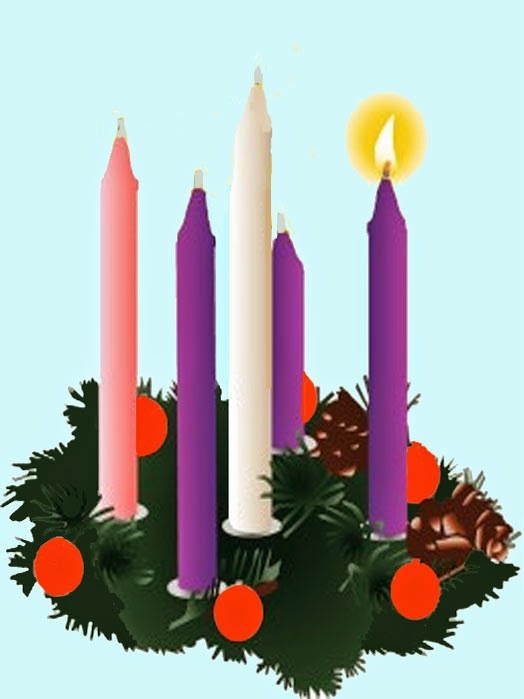 Our Advent Wreath usually has three red (Advent 1,2 and 4) and one pink candle (for Advent 3 - but you'll have to wait for that) with a central white candle (Christmas Day). As you might expect, today's readings all look towards the end times and seek 'the light of God's face (Psalm 80) and the desire for God to come down to us (Isaiah 64). We read of how we are not lacking in any spiritual gift whilst we wait for Him (Jesus) to return (1 Corinthians 1) and the Gospel reading talk about the end of it all and the signs - with the entirety for us to 'keep awake'. We traditionally sing the hymn above - it is our hope, our expectation and our heartfelt plea that Jesus does return, and soon at that (and yes, I have wondered whether He ever will and whether it might all be a con - it's what we are supposed to do - test, challenge, think and reason - and I can say that I do :-) ). Just as people put their house in order so that it looks right when the guests come visiting, the same is true for the penitential seasons as we prepare for the coming of a Baby in Bethlehem and a Resurrected Jesus at Easter. The problem is that when people tidy they generally just hide the stuff where it can't be seen. But Jesus is coming and can see all the rooms and so it's about more than hiding stuff from sight, it's about clearing it out. And so here we are on the second of 2014's annual clear outs. What a wonderful prayer for today and every day of our life, that we might not have our eyes closed and sinning but be wide awake and actively doing what is right. If only the Church was, the world would be a different place, wouldn't it? And that's why we do Advent (which like Lent is losing favour with some - something I am personally rather sad about ). So read the readings in the light of what I have written and pray that God shows you where the rubbish is to be found and gives you the courage to throw it out, whatever that might mean. Almighty God, give us grace to cast away the works of darkness and to put on the armour of light, now in the time of this mortal life, in which your Son Jesus Christ came to us in great humility; that on the last day, when he shall come again in his glorious majesty to judge the living and the dead, we may rise to the life immortal; through him who is alive and reigns with you, in the unity of the Holy Spirit, one God, now and for ever. O that you would tear open the heavens and come down, so that the mountains would quake at your presence - as when fire kindles brushwood and the fire causes water to boil - to make your name known to your adversaries, so that the nations might tremble at your presence! When you did awesome deeds that we did not expect, you came down, the mountains quaked at your presence. From ages past no one has heard, no ear has perceived, no eye has seen any God besides you, who works for those who wait for him. You meet those who gladly do right, those who remember you in your ways. But you were angry, and we sinned; because you hid yourself we transgressed. We have all become like one who is unclean, and all our righteous deeds are like a filthy cloth. We all fade like a leaf, and our iniquities, like the wind, take us away. There is no one who calls on your name, or attempts to take hold of you; for you have hidden your face from us, and have delivered us into the hand of our iniquity. Yet, O Lord, you are our Father; we are the clay, and you are our potter; we are all the work of your hand. Do not be exceedingly angry, O Lord, and do not remember iniquity for ever. Now consider, we are all your people. O Lord God of hosts, how long will you be angry at your people’s prayer? You feed them with the bread of tears; you give them abundance of tears to drink. You have made us the derision of our neighbours, and our enemies laugh us to scorn. Turn us again, O God of hosts; show the light of your countenance, and we shall be saved. Let your hand be upon the man at your right hand, the son of man you made so strong for yourself. And so will we not go back from you; give us life, and we shall call upon your name. Turn us again, O Lord God of hosts; show the light of your countenance, and we shall be saved. I give thanks to my God always for you because of the grace of God that has been given you in Christ Jesus, for in every way you have been enriched in him, in speech and knowledge of every kind— just as the testimony of Christ has been strengthened among you - so that you are not lacking in any spiritual gift as you wait for the revealing of our Lord Jesus Christ. He will also strengthen you to the end, so that you may be blameless on the day of our Lord Jesus Christ. God is faithful; by him you were called into the fellowship of his Son, Jesus Christ our Lord. ‘But in those days, after that suffering, the sun will be darkened,and the moon will not give its light, and the stars will be falling from heaven,and the powers in the heavens will be shaken. 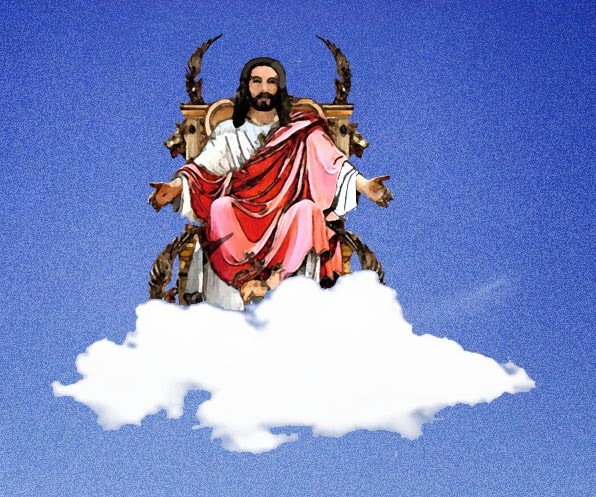 Then they will see “the Son of Man coming in clouds” with great power and glory. Then he will send out the angels, and gather his elect from the four winds, from the ends of the earth to the ends of heaven. The eyes of all wait upon you, O Lord, and you give them their food in due season. You open wide your hand and fill all things living with plenty. The Lord is righteous in all his ways and loving in all his works. He fulfils the desire of those who fear him; he hears their cry and saves them. The Lord watches over those who love him, but all the wicked shall he destroy. My mouth shall speak the praise of the Lord, and let all flesh bless his holy name for ever and ever. It has become a dwelling-place of demons, a haunt of every foul spirit, a haunt of every foul bird, a haunt of every foul and hateful beast. Let them bring them, and tell us what is to happen. Tell us the former things, what they are, so that we may consider them, and that we may know their outcome, or declare to us the things to come. Tell us what is to come hereafter, that we may know that you are gods; do good, or do harm, that we may be afraid and terrified. You, indeed, are nothing and your work is nothing at all; whoever chooses you is an abomination. I stirred up one from the north, and he has come, from the rising of the sun he was summoned by name. He shall trample on rulers as on mortar, as the potter treads clay. Who declared it from the beginning, so that we might know, and beforehand, so that we might say, ‘He is right’? There was no one who declared it, none who proclaimed, none who heard your words. I first have declared it to Zion, and I give to Jerusalem a herald of good tidings. But when I look there is no one; among these there is no counsellor who, when I ask, gives an answer. No, they are all a delusion; their works are nothing; their images are empty wind. And then, as one of them, having thrown caution and that which is right to the wind, you RECLINE in their company. This 'Rake's Progress' is the path to becoming a sinful person. But it also works for those who would bring others into relationship with God for first we speak SOUND and efficacious WORDS and the wisdom of what we say and the balance that is to be found in our words (and our lifestyle) resonates with those who are far off from God and causes them to STOP and engage and soon they are to be found as part of our company, RECLINING, with believers and in a place whereby they can be introduced to someone who can tell them everything they ever did and lead them into healing and holiness despite who we have been. It is a good thing for us to be able to engage with 'the world' in such a way as to be found acceptable to those who are distant from God but there are some pitfalls in that whilst it is good to find favour with those outside of the Church, it is wrong to become like the world to do so. Yet this is something I am consistently being challenged with by some that I meet as in their quest for popularity they put off holiness - a great danger for us all. Being Christian has never been a path that would win many popularity contests for it contains a good many DON'Ts (usually relating to the things we like to do) and even more DO's (which urge us on to do things we don't really want to do! It's all well and good being someone who can, by looking like the world, find favour with those who are outside the Church BUT the thing is that however hard we try, we come to a place where regardless of the words we utter - the fruit of our lips and the seeds that we sow speak of the enemy rather than the Christ. We must work at keeping our walk straight and our talk edifying - something that appears to be a struggle for all of us - because if we do not possess that 'otherness' that being a follower of Jesus, the Christ, commands, then how can we lead others into that place? 'After you've got your converts you make them twice as fit for hell! So today the choice is ours - who are we going to serve? The Lord has indeed done great things for us, and therefore we rejoiced. Restore again our fortunes, O Lord, as the river beds of the desert. Those who sow in tears shall reap with songs of joy. It is in vain that you hasten to rise up early and go so late to rest, eating the bread of toil, for he gives his beloved sleep. Children are a heritage from the Lord and the fruit of the womb is his gift. Like arrows in the hand of a warrior, so are the children of one’s youth. Happy are those who have their quiver full of them: they shall not be put to shame when they dispute with their enemies in the gate. Church - not an island! For those who have mailed me asking where I vanished to, the answer is 'nowhere' I merely took some time to step back and reflect away from the blog as part of a bit of spiritual discipline. It wasn't because I was too busy and it wasn't because I was sleeping in a hammock in the garden (brrrrr) - but what it was turned out to be fun and rather worthwhile. I am struggling with Christians who seek to make Church work for them by means of one of the most powerful things known to man: The 'Someone else's problem' field. This creation born out of an astute observation from the late Doug Adam's makes known something that is truly the most invisible thing on the planet - and this is perhaps one of the most effective curses acting against the Church today. I was recently made aware of a situation where some wrong action on the part of a leader from elsewhere was made apparent. When I asked what the person telling me was going to do about it, their response was, "Oh, I thought I'd tell you!" "Fair enough," thought I as I asked them, "But why tell me, what can I do?" The response was so very typical of Church as a breed of people for what they wanted was for me to do something about it because they, "Didn't want to get involved and especially didn't want to end up in some form of confrontation over it!" But of course, as a leader, it was OK if I did! "But if you have seen it, surely you should address it," I said (feeling myself being painted into a corner), "After all, that's how the Bible tells us to handle it." But the person who had brought the complaint was going to have nothing to do with it. They knew that what they had seen was wrong but in the name of peace they chose to cover the sins of others and compound their own sins in the process. therefore tell those who cover it with whitewash that it is going to fall. and violent winds will burst forth. My problem is that I, like the many others who see things and remain silent, may be found at time to lack the moral courage to make the stand I should. 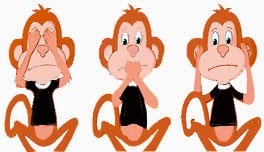 My problem is that when I have made the stand, the perpetrator of the wrong merely ignores any correction and continues in their wrong behaviour. My problem is that when I have taken my complaint to those above me, they merely act as if nothing has been said and so add warrant to the wrong behaviour. Finally, at the tip of it all I find the comment, "Oh well, that's not our problem is it, that's a problem for another church." The reality of course it that it is problem for the whole Church and to permit, or turn a blind eye to it, because it's, "Not our problem," is to permit the Church to be tainted and wrong and it is in this that we permit the Church to be hypocritical and wrong. Never have the words, "Let those who have ears, let them hear," had some much relevance. His work is full of majesty and honour and his righteousness endures for ever. He appointed a memorial for his marvellous deeds; the Lord is gracious and full of compassion. their righteousness stands fast for ever; their head will be exalted with honour. The wicked shall see it and be angry; they shall gnash their teeth in despair; the desire of the wicked shall perish. The Lord is the everlasting God, the Creator of the ends of the earth. He does not faint or grow weary; his understanding is unsearchable. He gives power to the faint, and strengthens the powerless. I, the Lord, am first, and will be with the last. and delight in mere idols. Bow down before him, all you gods. Sing to the Lord a new song, for he has done marvellous things. His own right hand and his holy arm have won for him the victory. The Lord has made known his salvation; his deliverance has he openly shown in the sight of the nations. He has remembered his mercy and faithfulness towards the house of Israel, and all the ends of the earth have seen the salvation of our God. Sound praises to the Lord, all the earth; break into singing and make music. Make music to the Lord with the lyre, with the lyre and the voice of melody. With trumpets and the sound of the horn sound praises before the Lord, the King. Let the sea thunder and all that fills it, the world and all that dwell upon it. An idol? —A workman casts it, and a goldsmith overlays it with gold, and casts for it silver chains. As a gift one chooses mulberry wood—wood that will not rot—then seeks out a skilled artisan to set up an image that will not topple. Lift up your eyes on high and see: Who created these? He who brings out their host and numbers them, calling them all by name; because he is great in strength, mighty in power, not one is missing. Eternal Father, whose Son Jesus Christ ascended to the throne of heaven that he might rule over all things as Lord and King: keep the Church in the unity of the Spirit and in the bond of peace, and bring the whole created order to worship at his feet; who is alive and reigns with you, in the unity of the Holy Spirit,one God, now and for ever. Amen. O Lord, how glorious are your works! Your thoughts are very deep. The senseless do not know, nor do fools understand, that though the wicked sprout like grass and all the workers of iniquity flourish, It is only to be destroyed for ever; but you, O Lord, shall be exalted for evermore. O worship the Lord in the beauty of holiness; let the whole earth tremble before him. Tell it out among the nations that the Lord is king. He has made the world so firm that it cannot be moved; he will judge the peoples with equity. This is the last Sunday of the church's liturgical year - next week a new year begins (we have three A, B and C) with Advent - the old year ending with a Sunday taken up with Christ the King. Jesus on His throne - settling accounts - the time to be judged. Not a popular image for we'd rather, I'm sure, like to think Jesus dies for all on the cross and so we all get in regardless of the who, what or how - which is a nice thought (called 'universalism') but I'm not convinced by it myself. may by you be plenteously rewarded; through Jesus Christ our Lord. Now there's a prayer - talking about good works and reaping the reward - all very PWE (Protestant Work Ethic) isn't it (a Catholic friend once told me, "We don't have a work ethic of reward, here it's all done by guilt!"). Today is about jesus as King - it's about us recognising who He is and worshipping Him: It's about looking at who we are and the many, many, many ways that we have failed and celebrating the many, many, many ways in which we have good that which was goos and right and Christlike too. It's not about the big stick but about, in this season of Christmas trees it's about: Seeing the Cross through the trees. It is not about flashing lights and Argos catalogues but about taking the lead on the Christmas lights and following it all the way to the plug: And the plug is found in a stable in Bethlehem! Today we are presented with a chance to look at ourselves as reflected in the eyes of Jesus and to see Him as King and us as forgiven. That's something you'll never find in an Argos catalogue!!! Illumine me by His life, light and love, I pray. Amen. Come, let us worship and bow down and kneel before the Lord our Maker. For he is our God; we are the people of his pasture and the sheep of his hand. O God, you are my God; eagerly I seek you; my soul is athirst for you. My flesh also faints for you, as in a dry and thirsty land where there is no water. So would I gaze upon you in your holy place, that I might behold your power and your glory. Your loving-kindness is better than life itself and so my lips shall praise you. I will bless you as long as I live and lift up my hands in your name. Heavenly Father, whose blessed Son was revealed to destroy the works of the devil and to make us the children of God and heirs of eternal life: grant that we, having this hope, may purify ourselves even as he is pure; that when he shall appear in power and great glory we may be made like him in his eternal and glorious kingdom; where he is alive and reigns with you, in the unity of the Holy Spirit, one God, now and for ever. AllAmen. 1 Hear my crying, O God, and listen to my prayer. 2 From the end of the earth I call to you with fainting heart; O set me on the rock that is higher than I. 4 Let me dwell in your tent for ever and take refuge under the cover of your wings. 5 For you, O God, will hear my vows; you will grant the request of those who fear your name. 6 You will add length of days to the life of the king, that his years may endure throughout all generations. 7 May he sit enthroned before God for ever; may steadfast love and truth watch over him. 8 So will I always sing praise to your name, and day by day fulfil my vows. 1 On God alone my soul in stillness waits; from him comes my salvation. 2 He alone is my rock and my salvation, my stronghold, so that I shall never be shaken. 3 How long will all of you assail me to destroy me, as you would a tottering wall or a leaning fence? 4 They plot only to thrust me down from my place of honour; lies are their chief delight; they bless with their mouth, but in their heart they curse. 5 Wait on God alone in stillness, O my soul; for in him is my hope. 6 He alone is my rock and my salvation, my stronghold, so that I shall not be shaken. 7 In God is my strength and my glory; God is my strong rock; in him is my refuge. 8 Put your trust in him always, my people; pour out your hearts before him, for God is our refuge. 9 The peoples are but a breath, the whole human race a deceit; on the scales they are altogether lighter than air. 10 Put no trust in oppression; in robbery take no empty pride; though wealth increase, set not your heart upon it. 11 God spoke once, and twice have I heard the same, that power belongs to God. 12 Steadfast love belongs to you, O Lord, for you repay everyone according to their deeds. Let Mount Zion rejoice and the daughters of Judah be glad, because of your judgements, O Lord. Walk about Zion and go round about her; count all her towers; consider well her bulwarks; pass through her citadels, that you may tell those who come after that such is our God for ever and ever. It is he that shall be our guide for evermore. At the end of their rule, when the transgressions have reached their full measure, a king of bold countenance shall arise, skilled in intrigue. He shall grow strong in power, shall cause fearful destruction, and shall succeed in what he does. He shall destroy the powerful and the people of the holy ones. The second woe has passed. The third woe is coming very soon. Lord God, who taught Elizabeth of Hungary to recognise and reverence Christ in the poor of this world: by her example strengthen us to love and serve the afflicted and the needy and so to honour your Son, the servant king, who is alive and reigns with you, in the unity of the Holy Spirit, one God, now and for ever. Amen. Morning Prayer - What's that about then? So this Vicar comes up to me: Soft spot!